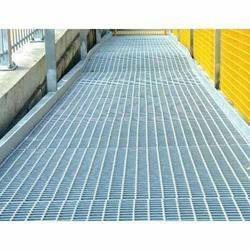 Leading Manufacturer of steel grating stair, steel gratings and mild steel grating from Pune. 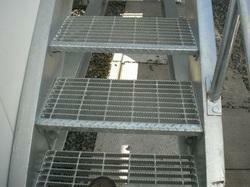 We are manufacturer and supplier of Steel Grating Stair as per client requirement. Steel Gratings offered by us are well recognized for their superior construction quality as well as availability in different designed finishes so as to match up with the specific end usage demands of the customers. Here, our rich industry and process experience also allows us to provide these gratings in galvanized finish so as to provide adequate protection from rust and corrosion. Also providing superior protection against slips in areas that prone to oil as well as in wet areas, we can also deliver these in custom finished specifications as demanded by the customers. Mild Steel Grating offered are made available by us in different material finishes including GRP, Steel and others in design and finish specifications as desired by the customers. These are widely preferred due to their superior functionality and come with suitable surface protectors that help in safeguarding the metal finish for longer time duration. Here, our expertise lies in making these available in different color finishes like in green, yellow and other options which also help in enhancing the surroundings. Some of the areas these are used in include walkways, open drainage near swimming pools, gardens, car parks and other places.